It's hard to believe it's taken me until Tuesday to post about our Thursday's homecoming from the hospital and subsequent recovery! The first day or two was just catching up on sleep and connecting with the little people who had missed me when I was gone. But the other few days have been trying to slow down enough to get a chance to post. 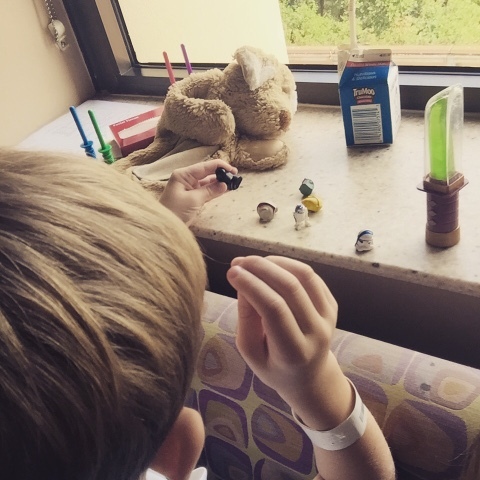 Alas, here is an update on the rest of our hospitalization and how things have been since we got home. Although Bennett was able to comfortably sleep at the hospital Wednesday night, I was able to get only 3 hours of sleep that night. It's SO hard sleeping in the hospital. The hallway lights beam brightly through the door window at all hours of the night. The machines make beeping noises and regularly call out for attention. Vital signs have to be checked. Nurses enter and exit the room as they please, inevitably making noises when they do. And that plastic lined couch that makes down in to a smaller-than-twin-sized bed could be no less comfortable. 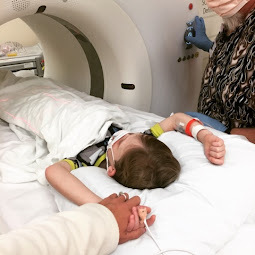 On top of that, I struggled to sleep because I was anxious that Bennett would wake up suddenly afraid of where he was...and because I knew that almost as early as the sunset, the nurses would be changing shifts and doctors and residents would be making their rounds. Sure enough, around 6am, we had people in our room saying good morning and checking on Bennett's condition. Thankfully, Bennett slept well at the hospital and woke up the next morning in a great mood. I was actually quietly whispering to the ENT resident at the edge of his bed when Bennett popped up awake from his sleep, smiled and said, "hello!" It was at that point that I knew he was going to be just fine. Recovery in the hospital went well. 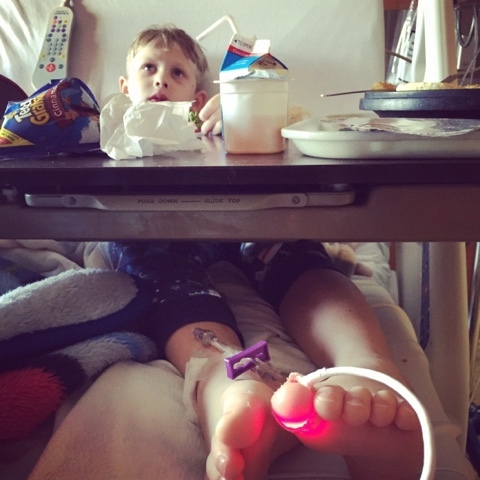 The thing that bothered Bennett the most was having an IV in his foot and an oximeter on his toe. However, he did a great job tolerating it. Of course, we still had to do treatments while in the hospital. 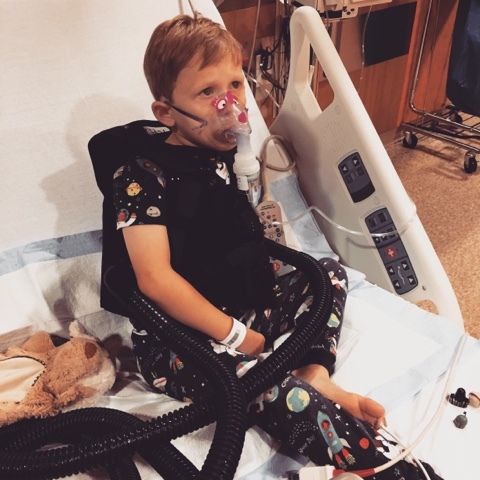 He never gets a break from breathing treatments. We got word that we were going to get discharged later that morning but it took a while to get our papers. This is because the entire Baylor-Scott and White hospital systemwide EPIC electronic charting server went out in the middle of the night and couldn't seem to come back online. Not only was our hospital affected but so were all of Baylor-Scott and White hospitals in all of Dallas and the surrounding areas. It was like being in the 1980's again. Nobody had access to the electronic medical records and no ability to chart electronically. It was all about that paper and pen at this point. Since this had never happened to the hospital before, it was funny to see how much clinicians rely on technology in the health care system these days. Everyone was very professional and calm about it. But it was obvious that knocked everybody for a loop. 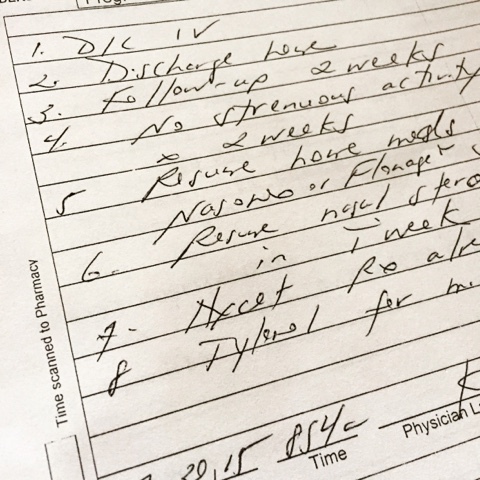 Unable to use the electronic system, our discharge papers had to be handwritten by our doctor. But then, unable to be sent electronically to another part of the hospital, the handwritten discharge papers actually got stuck in the tube on their way back down. So, that took some time to get them out. Thankfully, Bennett was very patient while we waited to be discharged. He just played with his Star War toys. 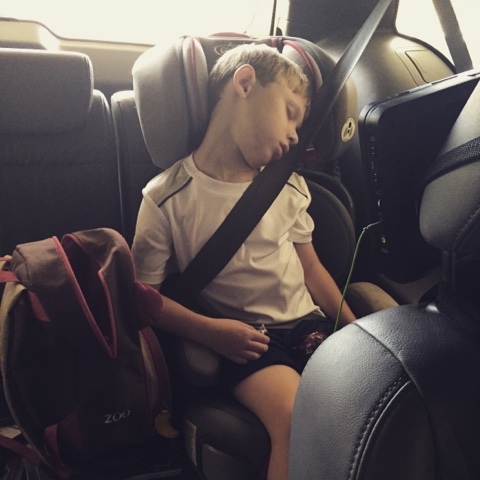 Bennett fell asleep on the way home from the hospital. I was super sleepy on the way home, as well. So, as soon as I came home, I headed for a few hour-long nap. Thanks to Brian and our sweet babysitter Peyton, who donated her time to me, for taking care of the kids once we were home. So, how is Bennett doing now? He is doing really well. Recovery from sinus surgery has been great. The first 24-48 hours brought some bloody noses. In fact, a bloody nose is our biggest risk for the next two weeks. But, for the most part, it hasn't been a problem. Bennett has complained of very little pain since we left the hospital. Bennett said he still has headaches but says they are milder than the ones before. I will ask the doctor about this if they have not resolved in the next two weeks. Bennett doesn't report breathing better but I'm not sure if it's because he still has dried blood and inflammation in his nose or if he just can't tell a difference. The cultures from Bennett's sinus surgery have come back. 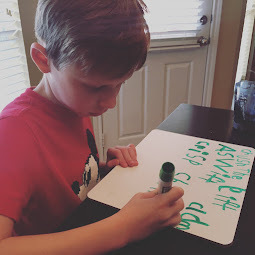 Fortunately, Bennett's cultures found he had antibiotic-sensitive staphylococcus aureus (MSSA) in his sinuses, the same thing he has in his lungs - a bacteria that has likely colonized in his system at this point. 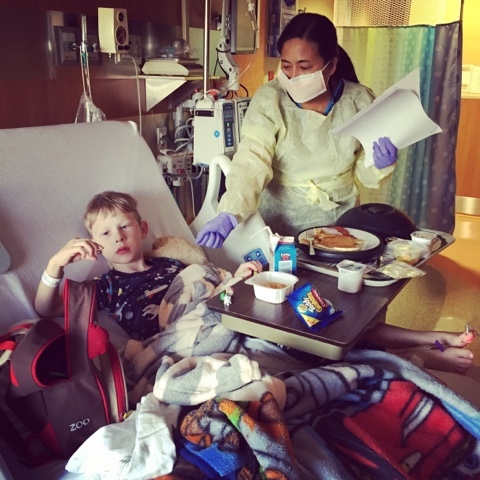 Bennett's ENT doc and CF doc have both agreed not to treat this infection at this time. "Staph" as it is often called is common in CF lungs and sinus cavities. 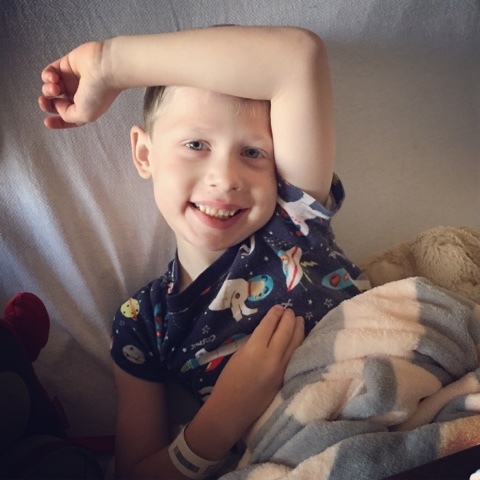 Although the bacteria could be treated, the doctors want to very careful not to overuse antibiotics that Bennett will likely need later. Antibiotics are critical to keeping Bennett well so overuse, even if necessary, will cause the bacteria to eventually become antibiotic-resistant. Antibiotic-resistant infections, such as MRSA, can be very harmful. So, for now, we are thankful for this milder bacteria and pray it is the only one he colonizes any time soon. 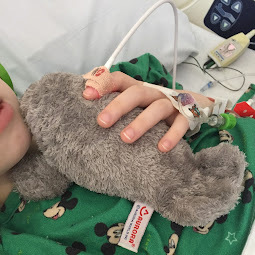 We will go for a post-op appointment in a few weeks but, overall, we had the best outcome we could hope for - a necessary surgery completed successfully and test results that show he has no serious infections yet. CF is a time bomb. It's only a matter of time before we are dealing with more serious things. But every moment that we are dealing with less-serious things is a gift! 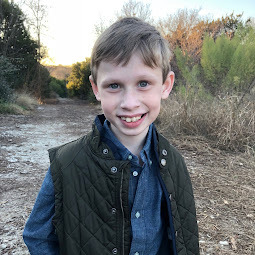 Brian and I are so thankful that Bennett has now had the surgery, is no longer in pain and no longer has thick mucus clogging his sinus cavities. We are ever aware that our blessings are plentiful and we are thanking God for every one!